As you compare your solar energy options, you may have heard your solar installer discuss wiring your solar panels in series or in parallel. How you wire your panels can impact the performance of your system, but the question is, which option is best for your home? The capacity of a solar panel to produce energy is measured in watts, which is calculated by multiplying a solar panel’s voltage by the amps of current it produces. When a solar installer builds a solar energy system, they need to find the right balance of voltage and amps to ensure that the system performs well. Depending on the equipment that the system uses and the size of the system, your solar installer may decide to wire your solar panels in series, in parallel, or in a combination of the two. 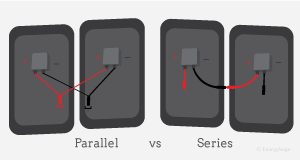 Here are the fundamental difference between wiring solar panels in series vs. in parallel. 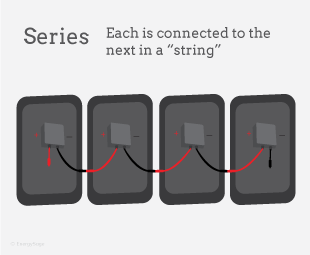 When a solar installer wires your solar panels in a series, each panel is connected to the next in a “string.” The total voltage of each solar panel is summed together, but the amps of electrical current stay the same. When you wire in series, there is just a single wire leading from the roof for each string of solar panels. When an installer wires your solar panels in parallel, each panel’s wires are connected to a centralized wire leading from the roof. The amps of electrical current for each solar panel are summed together, but the system voltage stays the same. 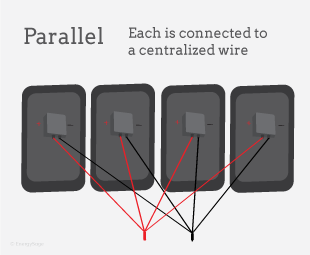 Wiring your solar panels in parallel results in more wires running from your solar panel system. Are solar panels in series or parallel better for you? The advantages of wiring solar panels in series vs. parallel are dependent on the technical specification of your solar energy system’s panels and inverter. The qualified, pre-vetted installers on the EnergySage Solar Marketplace will be able to tell you the best option for your system. Register your property on EnergySage to solicit quotes and compare equipment, financing, and installation options.